Burial benefits include a gravesite, opening and closing of the grave, vault (or liner), perpetual care, a Government headstone or marker. A burial flag is provided by the funeral home at no cost to the family. In a National Cemetery, burial benefits are available for spouses and dependents. The gravesite, opening and closing of the grave, vault (or liner), perpetual care, and the spouse or dependents name and date of birth and death will be inscribed on the Veteran's headstone, at no cost to the family. Eligible spouses and dependents may be buried at a national cemetery, even if they predecease the Veteran. Gravesites in National Cemeteries cannot be reserved in advance. You should advise your family of your wishes and where your DD-214 (Honorable Discharge) is kept. These papers are very important in establishing your eligibility. If you are interested in Preparing in Advance, we will then keep a copy of your DD-214 (Honorable Discharge) on file. To Prepare in Advance, click on the PRE-PLAN tab above. 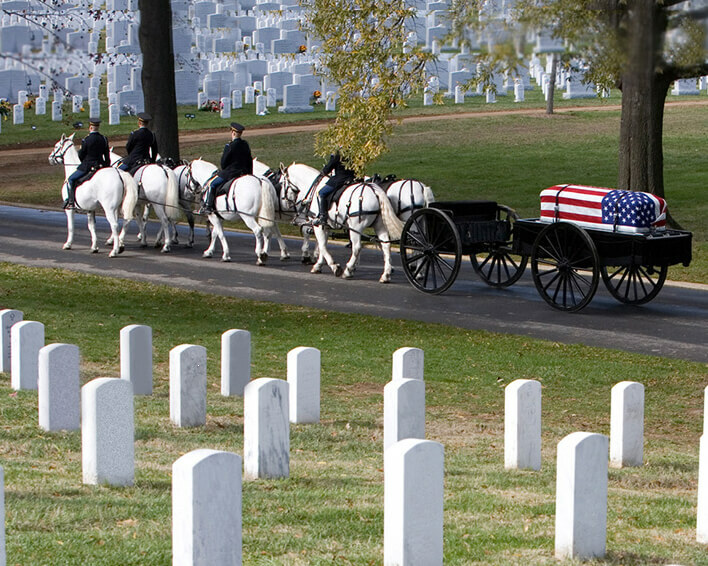 At the time of need, we will assist the next-of-kin with making burial arrangements at the national cemetery. To schedule a burial, we will fax all discharge documentation to the National Cemetery Scheduling Office at 1-866-900-6417 and follow-up with a phone call to 1-800-535-1117. When burial is in a national cemetery, we will complete the headstone or marker application form and have the next-of-kin sign it. The next-of-kin will then write down the inscription they would like for the marker.